Khalaf Al Habtoor, Founding Chairman of the Al Habtoor Group received a delegation from the Dubai Police Esaad Programme Committee at the Al Habtoor Group head office on 14 January 2019. Mona Al Ameri, Head of the Happiness Committee, Dubai Police, thanked Al Habtoor for his continuous support for the Dubai Police employee happiness initiative and presented the Al Habtoor Group Chairman and Vice Chairman & CEO, Mohammed Al Habtoor with their personalized Esaad cards. Dubai Police representatives included Samya Shaheen, Khalid Alsuwaidi, Ahmed Bin Ghafan, Ibrahim Alblooshi, Salah Amin, Mohammed Shoaib Albalooshi, Gaafar Salim, Sayed Ibrahim, Abdullah Haidarah, Hasan Saleh, Thureya Balhoul, Waheeda Abbas, Waheeda AbdulQadir, Mariyam Saeed Abdulhakeem, Khalil Ibrahim Ali and Mahmood Ibrahim. Also present was Abdul Salam Marzooqi, Director of UAE Affairs and Community Relations, Al Habtoor Group. Khalaf Al Habtoor said, “I am happy to collaborate with the Dubai Police in their Esaad Programme and be able to show our men and women in the Dubai Police corps our appreciation for their commitment to our safety. 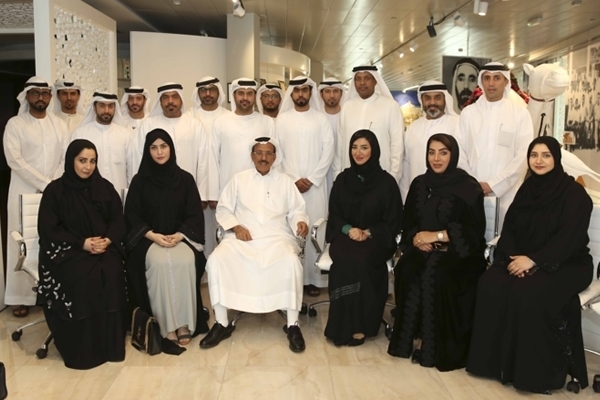 Khalaf Al Habtoor called for the private sector to work closely with the public sector and commended the Esaad Programme Committee for their efforts to reward employees for their performance, commitment and dedication to the job. Mrs Mona Al Ameri thanked Al Habtoor for the warm welcome and gave a detailed brief about the ESAAD card and its uses across various sectors including: education, tourism, hospitality, aviation, entertainment and leisure, real estate and retail. Al Ameri commended the Al Habtoor Group for its continuous support for community activities, noting that the ESAAD programme is an innovative programme designed to achieve happiness in the community. The Al Habtoor Group joined the ESAAD programme in October 2017 offering Dubai Police staff extended benefits and discounts at Habtoor Hospitality and Real Estate properties, including hotels, restaurant, leisure and entertainment facilities in the UAE and abroad. Dubai Police staff are offered a 50 per cent discount at Al Habtoor Group hotels in Dubai and internationally, as well as a 20 percent reduction at the Group’s leisure and entertainment facilities. It also includes special rates on the brand-new apartments at Al Habtoor City Residence Collection.